I don't know how many of you here use a quick detailer spray for your cars but I do quite often (usually about once a week) due to having a black car that shows every little speck of dirt. Since starting to use quick detailers I have tried several different ones although I cannot remember them all up until recently I really liked McGuires ultimate detailer. 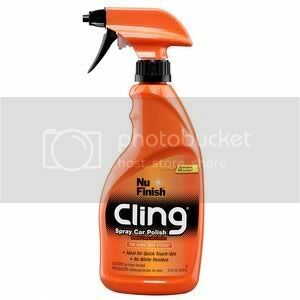 I recently tried NuFinish Cling instant detailer. This stuff is amazing, it leaves no residue and requires very minimal buffing, pretty much just wipe it off quick and you're good. It makes my car shine like I have never seen before. I highly recommend anyone that loves a shiny clean ride to try this stuff out, it was pretty cheap too i think like $6. Here is a picture of it. i would have posted a pic but i forgot my camera in PA when i was on vacation, it is on its way to me now i will post one when i get it. my apologies everyone, i actually used the spray car polish not the detailer, regardless the stuff is amazing here is a pic of the polish. Nice I must buy some to try out when I run out of my Mothers showtime detailer. I rarely use it only when I get bird crap on my car and don't have time to wash my car or im out somewhere.